What is it like putting together an exhibit? In a sentence, lots and lots and lots of work, but really fun work at that! 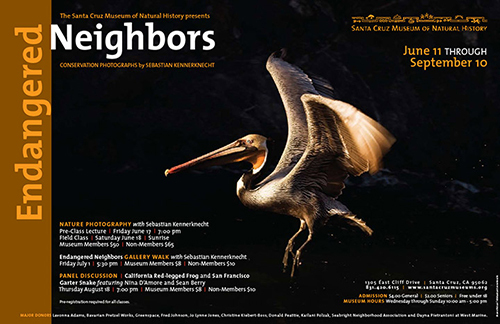 The Santa Cruz Museum of Natural History and I have been working on the Endangered Neighbors exhibition for the last four years. I approached them with the idea of having an exhibit about the threatened and endangered wildlife of the central coast with information about why they are endangered, what people are doing to protect them, and what easy steps we can all take to ensure their survival. They loved the idea so I started to photograph for it while also fundraising for the project. The photography was probably the easiest part of it all, plus it meant I was doing what I really loved. The great thing about having such concrete goals about what images you are trying to capture means you concentrate your efforts on getting those pictures which I truly believe leads to better photographs in the end. It is almost like having your own magazine assignment were there is a deadline and a shot list comprised of must have images. I can only highly recommend coming up with your own photographic project, I can assure you that your images will be better than if you just photograph things aimlessly. In terms of the fundraising, let me tell you, trying to get people to give you money is not an easy thing. In total the museum and I wrote over 40 grant applications but got rejected every single time (well that is if you are lucky enough to get any kind of response)….I do think this speaks for my lack of ability to write a proper grant proposal as well though. Then, a year ago we signed the project up with kickstarter which turned everything around. Kickstarter is a site where people can safely make donations towards a project and depending on how much money they donated they get a reward that you have pre-determined. Over 50 people donated a total of over $6000. I will never be able to thank all of those people enough! So at this point we have the digital images and the money, sounds like all the bases are covered, right? Man is that wrong. Now it’s time to choose the images, create metal prints, create marketing material, thank you lists, products to be sold in conjunction with the exhibit, interactive materials, and labels that are very readable, brief, yet informative. All of this takes about another six months with five people working on it. Thank you to the museum staff! Finally, the time has come, the exhibit opens up in a little over two weeks and I can’t wait! I hope you get a chance to visit the museum between June 11th and September 10th to see the Endangered Neighbors exhibit! Just a quick note. 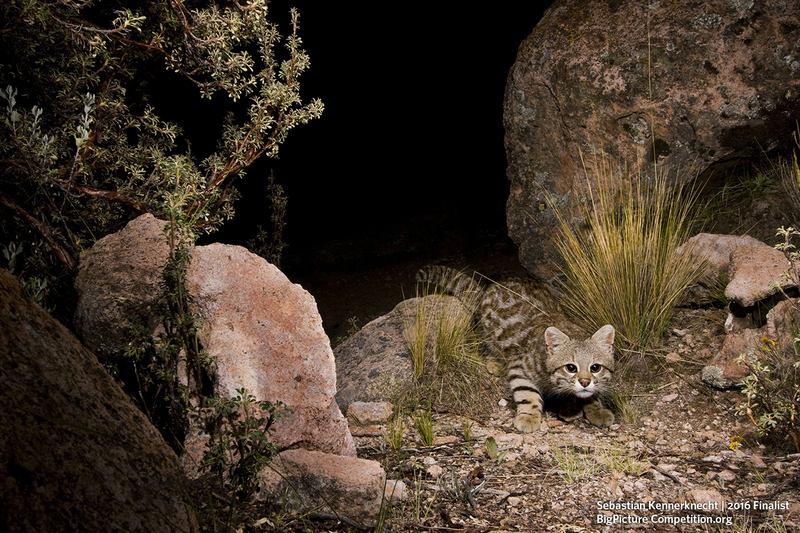 The 2010 Veolo Enviroment Photographer of the Year was announced today. Great thing too, it’s ants that won the grand price. 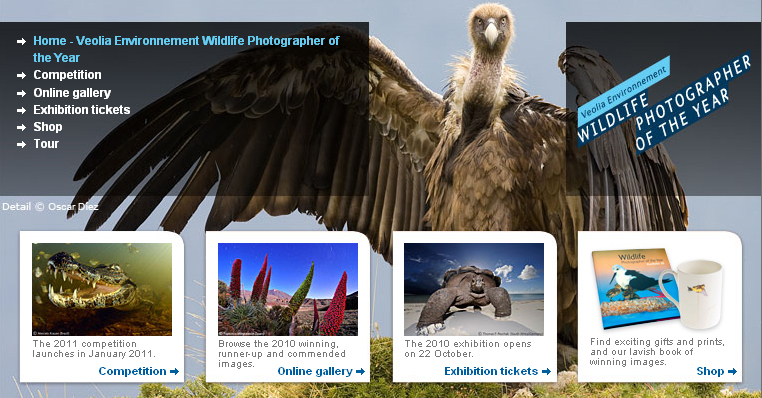 I didn’t enter any pictures this year but if you enjoy looking at stunning photography please take a look!